Something new to my blog today. 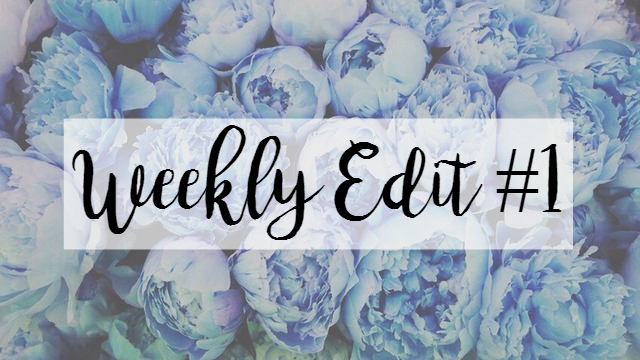 I've seen these weekly edit type of posts floating around the blogosphere for quite a while and I'd never really thought to do one because I can assure you that my weeks are not that interesting. However, this week I've been on half term from Sixth Form and I've been doing quite a lot which is surprising but I hate to break it to you; this isn't a weekly edit. This is more of a two/three-day edit because my sister's been in hospital week so all my exciting plans got cancelled so we have the first half of the week and then not really much more. This is a great start to a new series but I the next time I make up one of these posts there'll be a whole week. MONDAY: I went bowling with some friends from the school musical, I came second to last in the first game and last in the second game. I either need to stop going bowling or practice my bowling skills. All those years playing bowling on the Wii obviously have not paid off. TUESDAY: Me and my best friends from my high school went out for a meal for my birthday. We went to Bella Italia and I ate so many carbs. We had the most delicious starter of a sharer plate of mini garlic bread, I then had tomato pasta which I didn't hate it just didn't have a lot of flavour, and then I was embarrassed when the waitress brought out my gelato with a candle in it. It was nice to catch up with them seeing as I don't see them very often because I go to a different sixth form. WEDNESDAY: I TURNED 17 BITCHESSS! Yes, I'm a year closer to being an adult and even though that terrifies me, I was really excited for my birthday. I got lots of things including Hamilton books, a Great British Bake Off colouring book, a photo frame collage of me and my family, along with a tonne of beauty bits. Even though I spent my birthday in hospital with my older sister I had a really nice time being with all my family. Plus, one of my sister's uni friends gave me a card, a box of chocolates and a balloon. I love my sister's uni friends a lot. THURSDAY: I literally did nothing! I sat on the sofa all day eating and watching GLEE, which I am in love with. FRIDAY: I went back to Leicester to visit my sister again who was still in the hospital and even though we had to wear aprons, masks and gloves whilst sat in the same room as her we had a great day, full of lots of laughs. My mum also took me out for lunch before we went and visited her because I didn't get to do much on my birthday, I had the best burger! SATURDAY: I woke up much later than I should have and did nothing again apart from watch videos for university tips and play Facebook Messenger games against my sister who came home from the hospital! SUNDAY: Major panic set in as I realised I spent a whole week doing no work so I quickly wrote an essay for my English Language class and read a couple of chapters of Frankenstein for my English Literature class. So there it is my weekly edit. I'm not too sure whether this is how I'm going to continue with my weekly edits but who knows, I guess we'll all find out the next time I do one of these. So until my next blog post, I love you all millions!